On Aunt Mildred's Porch: No Sir, Not My Baby! 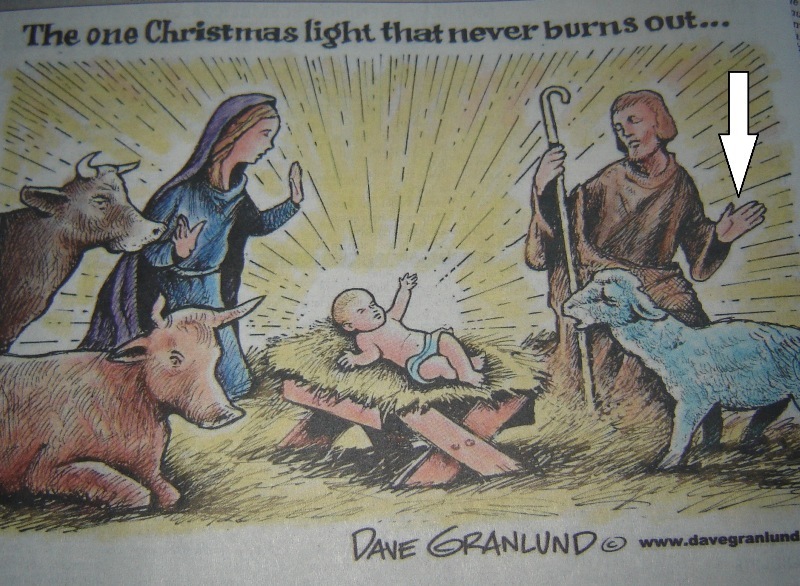 This cartoon was in the editorial part of the newspaper today. I don't usually pay much attention to those cartoons because half the time I don't understand them and the other half, I don't like them. To me, comics are meant to be funny, so if they aren't, I can't be bothered. But today's struck me as a little odd. 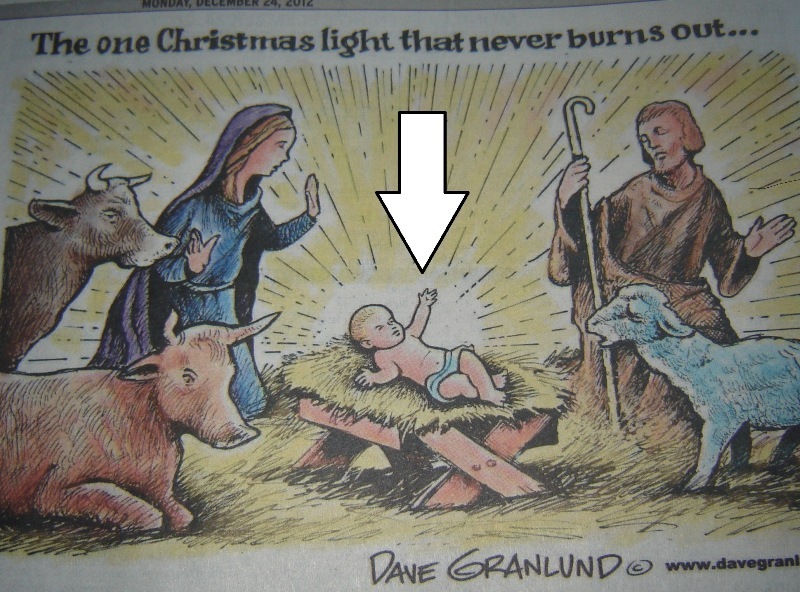 First of all, I'm not too thrilled with the baby Jesus looking like a character out of Beavis and Butthead or King of the Hill. I already don't like his attitude. "Yeah, that's right, I'm here. You got a PROBLEM with that?" 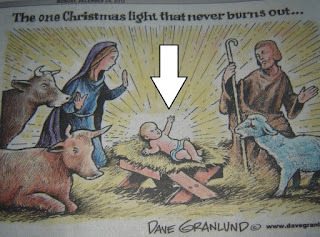 "I'm the freakin' Savior, now bring me some milk"
"Oh look at me, I make rays of sunshine." "Whoa, I have NO IDEA where that came from! Look at me, do I LOOK like I just delivered the Son of God? And what's with all the light coming off of him? OMG is he radioactive? Joseph, I TOLD you we shouldn't have taken that shortcut through the nuclear power plant! 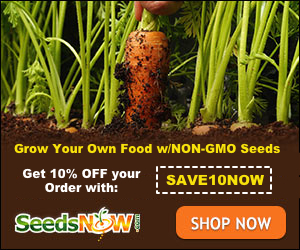 You never listen to me!" And Joseph's no better, standing there with his shepherd's crook. Wait, wasn't he a carpenter? What's he doing with a shepherd's crook? And notice the animals. The bull sitting down has a look of "holy cow (I had to do it) I can't believe what I'm seeing". The one standing is full of disdain with the entire scene going on in his barn. 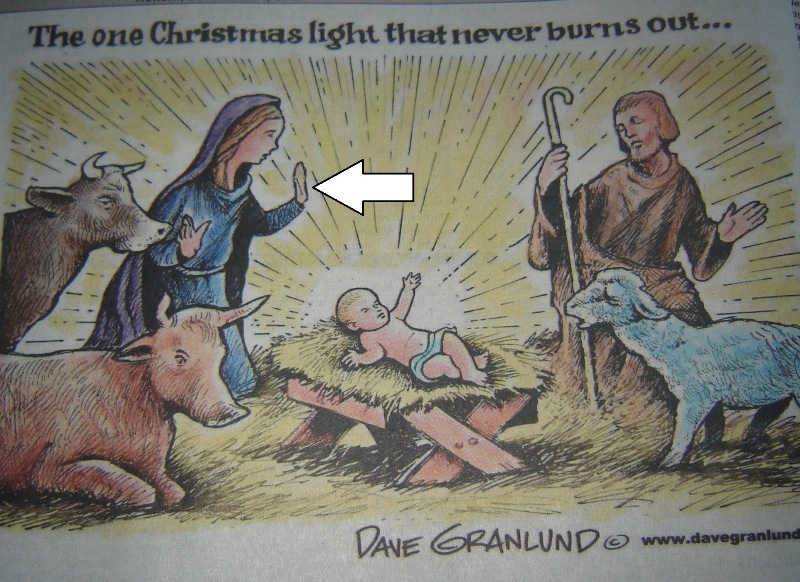 And The sheep probably just got spanked by Joseph (see his hand?) and is like "WTF is this kid doing in my food dish?????" 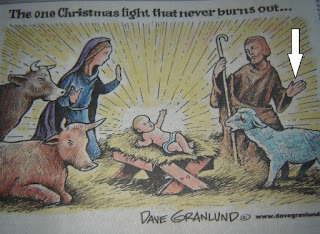 I agree that this is one light that will never burn out, but really, Dave Granlund has a lot of explaining to do. 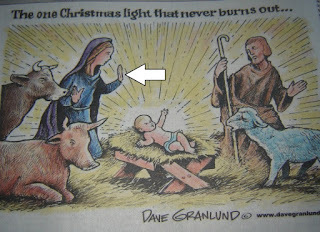 I hope your nativity scene is less distressing to the eyes than this one is! Merry Christmas!